The massive scale of wind farms is now increasingly spread over the countryside – a fact that can be attested by any resident of the Great Plains. Wind energy represents an ever-bigger slice of U.S. energy production in the Midwest and elsewhere. According to the American Wind Energy Association, approximately $143 billion was invested into new wind projects in the last 10 years. Yet, the surge in wind energy encounters a major barrier — i.e., how to effectively and economically store the energy produced by turbines when energy requirements are low. Turbines generate energy when the wind is blowing. We get a lot of wind at night, more than at daytime, but demand for electricity is lower at night, so, they’re dumping it or they lock up turbines — we’re wasting electricity. If we could store this excess at night and sell or deliver it during daytime at peak demand, this would allow wind farm owners to make more money and leverage their investment. At the same time, you deploy more wind energy and reduce demand for fossil fuels. Since 2010, Nguyen has been leading a research to come up with a state-of-the-art hydrogen-bromine flow battery—a sophisticated industrial-scale battery design that would be about the size of a semi-truck and which engineers have been attempting to develop since the 1960s. The new battery design could work just as well to store electricity from solar farms, which can later be discharged overnight when there is no sun. The project was first funded by the National Science Foundation and then by the Advanced Research Projects Agency-Energy. 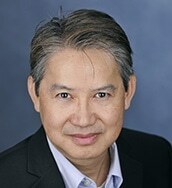 Nguyen has worked with scientists from the University of California at Santa Barbara, the University of Texas at Arlington, Case Western Reserve University, and Vanderbilt University. Along the way, Nguyen has supervised revolutionary work on critical components of hydrogen-bromine battery design. For one, Nguyen developed the electrode at KU. At the battery’s electrode, the electrical current enters or exits the battery when discharged. An electrode requires plenty of surface area in order to be maximally efficient. Nguyen’s team grew carbon nanotubes directly on the carbon fibers of a porous electrode to develop a higher-surface-area carbon electrode. Before our work, people used paper-carbon electrodes and had to stack electrodes together to generate high-power output. The electrodes had to be a lot thicker and more expensive because you had to use multiples layers — they were bulkier and more resistive. We came up with a simple but novel idea to grow tiny carbon nanotubes directly on top of carbon fibers inside of electrodes — like tiny hairs — and we boosted the surface area by 50-70 times. We solved the high-surface requirement for hydrogen-bromine battery electrodes. The development of an effective catalyst remained a major barrier before a hydrogen-bromide battery can be successfully commercialized. Such a catalyst not only speeds up the reactions on the hydrogen side of the battery but also offers higher output while withstanding the extreme corrosiveness in the system. ow, Nguyen is on the verge of solving this last obstacle, thanks to funding from an NSF sub-award through a private company, Proton OnSite. I think we’re on the verge of a real breakthrough. We need a durable catalyst, something that has the same activity as the best catalyst out there, but that can survive this environment. Our previous material didn’t have sufficient surface area to give enough power output. But I’ve been able to continue to work on this rhodium sulfide catalyst. I think we’ve figured out a way to increase surface area. We now have a better way, and we may publish that in three to six months — we have some minor issues to resolve, but I think we’ll have a suitable material for the hydrogen reaction in this system. The latest results to devise an advanced, industrial-scale hydrogen-bromine flow battery will be revealed at the meeting of the Electrochemical Society in Seattle this May. Over his research career, Nguyen has founded a number of startup companies and believes that the novel hydrogen-bromine battery could soon be commercialized, and could be easily scaled to MW (power) MWh (energy) scales, available in modular container form, roughly 1 MWh in a full-size container. He, however, cautioned that the battery could only be utilized in remote, industrial places— sites like solar and wind farms, where the large batteries are likely to be buried underground. According to the KU researcher, the rise of renewable energy would rely on technology innovations that make the economics attractive to investors and energy producers and hopes that the new battery design could play a major role.